Hello fellow mammas. We have missed you! We can’t wait to see you at the meeting this Friday where our speaker will be talking to us about exercise, health, and wellness. There may be some movement on our part, so leave the stilettos at home and wear some comfy clothes! We will be having our annual MOPS Easter Egg Hunt at Carl Miller Park on April 3rd and we need candy to fill the eggs! If you can, please bring candy (or stickers, small toys, etc.) to fit in the eggs over the next two meetings. We have lots of empty eggs so we just need the “filling”! More information about the egg hunt will come closer to the time. 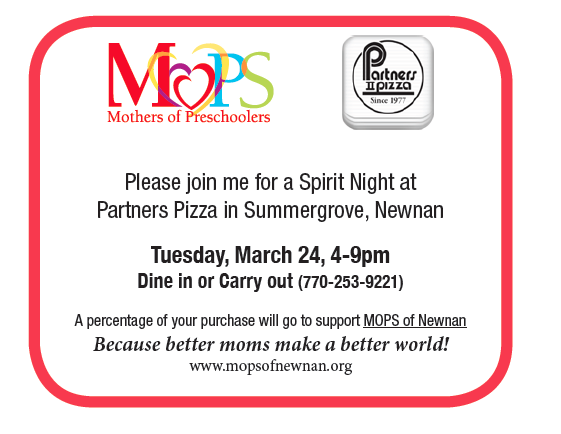 You can dine in or carry out (770-253-9221) and a percentage of the purchase price will support MOPS! Please save the date and remember to tell your friends. We’ll have mini flyers at your tables on Friday which you can take and hand to friends and family or print the Partners Pizza Flyer or attach the image below on your FB page, in emails, etc. Today’s devotional is from Jesus Today by Sarah Young. After many years of writing in her prayer journal, missionary Sarah Young decided to listen to God with pen in hand, writing down whatever she believed He was saying to her. She knew her writings were not inspired as Scripture is, but journaling helped her grow closer to God. Like her bestselling book, Jesus Calling, the devotions in Jesus Today are written from Jesus’ point of view, and it is Sarah’s fervent prayer that our Savior may bless readers with His presence and His peace in ever deeper measure. I am watching over you continually. No matter what you are experiencing or how alone you feel, trust that I am with you – well aware of your circumstances. When you are in the throes of adversity, it is easy to feel abandoned. So it is crucial at such times to tell yourself the truth: Nothing can separate you from My loving Presence. When this truth has sunk deeply into your mind and heart, you are ready to commune with Me. You will find Me tenderly present with you as I enter into your suffering. The intimacy you share with Me is enhanced by adversity when you invite Me into your experience without bitterness or resentment. To enjoy these intimate moments with Me, you must trust Me – refusing to rely on your own understanding. Trusting Me involves consciously leaning on Me for support, just as leaning on a massive rock helps you keep standing when you are weary. I am indeed the Rock of your refuge. Excerpted with permission from Jesus Today by Sarah Young, copyright Thomas Nelson, 2012. Are you in the middle of a struggle? Do you feel abandoned by God? Pause for a moment and be reminded of the promises in Scripture that nothing can separate us from the love of God! Re-read the Bible verses above and be encouraged that Jesus is your Rock of refuge!